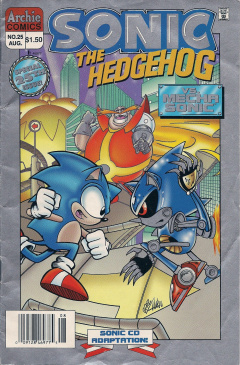 "Sonic the Hedgehog Vs. Mecha Sonic"
Sonic the Hedgehog 25 is the twenty-fifth issue of the Sonic the Hedgehog comic series. It was released in August 1995. This comic features one story: Go Ahead...Mecha My Day! The Freedom Fighters are all together in Rotor's lab. Sonic the Hedgehog is standing on a podium while Rotor works on installing a gadget into one of his shoes, boring the hedgehog due to the long process. He finishes up his work as Sally Acorn, at a monitor display, calls out that a feed is coming in. As Rotor looks closely at the work he's done on Sonic's shoe, a large image of Rotor's eye appears on Sally's monitor. She tells him to back away so she can test it out. Rotor officially reveals to Sonic his Sonicam, a small camera attached to his shoe. He starts revving up to run, causing the screen to show a dizzying image (making Antoine feel ill). Rotor tells Sonic to hang on, as he activates a slow-motion compensator in the camera, allowing them to see through the camera without the dizzying image. Sonic gets distracting from having to slow down initially, and crashes into a wall in Rotor's lab. Sally thanks Rotor for a job well done, noting the camera will come in handy. A curious Tails asks Sally how it will come in handy, as she reveals that the Freedom Fighters and Knothole Village are in danger. She walks over to the monitor and activates it. She tells Tails that they've located a new zone on Mobius that could endanger everybody. The zone is called the Collision Chaos Zone. Outside the newly constructed Collision Chaos Zone, a metallic complex created by Dr. Robotnik, the evil tyrant introduces the area to his minions. He walks over to his Piranha-Bot, revealing that he had opened up the zone for the Freedom Fighters to discover, to capture Sonic as he can't resist a challenge. He feeds the bot some metallic junk. In case the aspect of a challenge isn't good enough, Robotnik brings out a bag of Sonic-Grams that he stole from the U.S. Postal Service. He takes out one letter and opens it, reading it to his bot and showing an enclosed photo of one Amy Rose. He then walks over to a control panel and presses a button, opening a door nearby. A robotic figure comes out. Robotnik gives it the picture of Amy, and orders it to kidnap her. Later on, Robotnik makes a broadcast to the Freedom Fighters, appearing on the monitor in Rotor's lab. As Sonic never arrived at the Collision Chaos Zone, he calls him out as a chicken. Sonic takes the bait, but Sally stops him from running off into danger. Before he continues on, he jokingly states that he's received a bulletin. He brings out Amy Rose, revealing her as Sonic's biggest fan. She calls out to Sonic to help her, sending Sonic into a mad frenzy. He ends the transmission and ties Amy up with a rope, as a clone of Robotnik enters the room, stumbling around. The clone falls, revealing Snively in disguise. Robotnik lifts him up in anger, telling him to fly behind Sonic in his robo-pod and burn the trail as Sonic proceeds through his zone. He puts Snively down as he gloats over his presumed victory, as his plan will lead Sonic to a second zone where he will face a much greater challenge. To determine their next course of action, the Freedom Fighters have a meeting in a make-shift governmental hall. Sonic, however, is well aware of Amy Rose and wishes to avoid the red tape to save her right away. Sally's main concern is that Sonic is entering a zone which he has no idea about. Sonic is always into danger and he notes that he has Tails, who can scope the situation from the air. He jumps for joy as Sonic tells him to head on out and check out the new zone from the sky, despite opposition by Antoine to follow governmental procedures. He arrives over one of Robotnik's new factories, deciding the fly low to avoid detection. Unfortunately, his plan doesn't work, and he's easily caught by some SWATbots. Sonic waits a bit for Tails, but grows impatient. He grabs a map from Rotor and arrives at a portal to the Collision Chaos Zone. Before he can jump in, he's greeted by Robotnik on a monitor. He shows both Tails and Amy on the monitor to give Sonic even more incentive to enter the zone, which works. He enters a spindash and jumps into the portal. He starts going through the Collision Chaos Zone with no problem. Unknown to him, Snively is following behind in his Robotnik costume. Robotnik calls to Snively to begin operation "Burnt Bridges". Meanwhile, back at Knothole, Rotor and Sally watch Sonic's progress on the Sonicam. They notice a being following behind Sonic. They try to make the being out, but can't, until they stand upside-down. Only then, do they realize that Snively is following Sonic and burning the path behind him. He reaches the end of the zone and finds another portal. He jumps in. He enters the second zone, meeting up with a new arch-nemesis: Mecha Sonic. The robotic doppelgänger gloats, telling Sonic that his friends are at the end of the Stardust Speedway Zone. Sonic thinks about doubling back, but notices that Snively has arrived to continuing burning the path behind him. With no other option, Sonic jumps at Mecha Sonic and engages him in combat. Robotnik laughs as he witnesses the two fighting, while Amy starts to cry. Tails asks her what's wrong, as she reveals that she wants to marry Sonic. Back in Knothole, the Stardust Speedway is interfering with the Sonicam, preventing Sally and Rotor from watching Sonic's progress. Sonic and Mecha Sonic start their race through Stardust Speedway. Although they are able to pass eachother on numerous occasions on the windy road through a city, neither of them can make any great leads, keeping a stalemate as they go through. At the end of the line in Stardust Speedway, Crabmeat and Robotnik stand at a make-shift finish line. Crabmeat goes to tell the plan, but Robotnik would rather do so, ordering the robot to check the lettering below the finish structure. It goes under the structure and checks the 'FINISH' writing on the floor. As it confirms the correct spelling, Robotnik hit a trigger, sending a huge wall down and crushing Crabmeat. Even if Sonic should somehow beat Mecha Sonic, Robotnik plans will ensure that Sonic loses in any case. The race has gone on for quite some time, but Sonic is ahead a bit. The two continue to exchange taunts. A speed bump pops up on the road, causing Sonic to trip and fall. He looks over to see Mecha Sonic manning the bump controls, stating that he was racing a hologram for some time. Above the zone, Rotor and Sally arrive in a biplane. They fly over the finish area and easily notice Robotnik's figure. Sally puts on a parachute, telling Rotor to complete his mission, while she completes her's. She jumps out to confront Robotnik. Elsewhere in the zone, the race continues between Sonic and Mecha Sonic, who are still at a stalemate. Sonic decides to use this time to show off his new move: the Figure-Eight Super Peel-Out. He charges up and launches ahead at an extreme amount of speed. Mecha Sonic increases its output and tries to match the speed, but the speed requires it to exceed its maximum exertion levels. Its legs start to melt due to the friction from the speed, causing it to malfunction, and ultimately, break up, as Sonic approaches the finish line. Right as he arrives at the finish line, Sally drops down and kicks Robotnik away from the barrier control, allowing Sonic to pass the line successfully. Amy and Tails celebrate with joy, while Mecha Sonic skids to a halt near the finish line, broken in pieces. Robotnik starts to have a tantrum, claiming that is plan was foolproof. However, Sonic claims he could see the finish line trap from a mile away. To make him happy, Sonic even volunteers to stand under the line arch, even telling Robotnik to activate it. He does so with pleasure, but Sonic is able to dash out of the way before the wall can hit him. Robotnik is confused at his failure, so he starts looking at the trap for any issues. While under the dropping wall, Sonic invites the reader to press the button, activating the trap. Sonic and the others pose for the reader, while Rotor flies by with a banner celebrating their 25th issue. Robotnik, meanwhile, states his infamous "I hate that hedgehog" line, caught under his own trap. This issue is a direct adaptation of the Sonic CD game, which was released two years prior to this issue. Metal Sonic is introduced, although named as Mecha Sonic. Amy Rose, in her Sonic CD form, is introduced. The exterior of the Collision Chaos Zone, including the large Robotnik head, curtain, and fires, along with the accidental reveal of Robotnik behind the curtain, references the great Oz and his chamber from the Wizard of Oz. The first hints of the governmental nature of Knothole Village (and the future Mobotropolis) are shown, as Sonic must convince the committee of the Freedom Fighters to be able to go to the Collision Chaos Zone. A Knuckles Chaotix poster is visible in the makeshift government hall. Posters of Vector, Espio, Ryo and the Sega Saturn logo are visible in Starlight Speedway. The credits page for this issue, near the back of the comic, contains a montage of all the characters shown to date in the comic series, including two versions of Uncle Chuck and Muttski (roboticized and normal).